Susie Beiersdorf and "that rarest of commodities"
Modern Cinema technology rotates around Open Source code: JPEG, TIFF, AES encryption, the intra- and interwebz tech, among many other tools. MKPE has put up a Digital Cinema Accessibility Facts Sheet. DCinema in the SMTPE Compliant Era~! Pete Ludé posits from the view of having worked with worked with CableLabs, starting from the basic question – If we could buy a large light field display, how could we use it for different types of content (e.g., Sports, DIY Instructional Video, Concert, or Scripted Drama), and what parameters would be most relevant and needed (Field of View, Resolution, Viewing Distance) to come to how much data is required to capture in those cases. What Means, New SMPTE Pink Noise...and How? SMPTE ST-2095-1 is a new standard for Pink Noise. It took a great deal of work by a great number of clever people, a lot of listening and testing and tweaking. The cool thing is that it isn't made with a lot of transiticators, but rather, with digits. This is THE Digital Pink Noise Standard. Pink Noise has been one of those things that has always been around, and people don't think much about it. Flick a switch, and there it is. But it took a sophisticated circuit to do right, and it wasn't always implemented the same...or even well. That is much less likely now because with the standard is a python script that is very easy to implement. The equipment that you rely upon may already use it. For example, the great audio tools set named Audio Tools from Studio Six Digital, has already implemented it. But what if you just want to make some of your own? 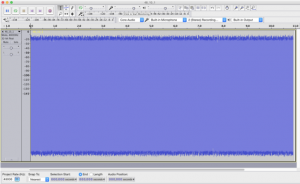 That is the point of this post – to give a few tips on how to create a usable Pink Noise .wav file using the python script that is delivered with the SMPTE Calibration Pink Noise Standard ST-2095-1...and with luck and permission, attached as a download here. Since the programming language ‘python’ is installed as a standard part of the Mac computer, that is what you'll see with the drawings and instructions following. There are also some pictures of the basic use of the Audacity, the free and Open Source audio tool. Audacity is available for Windows, but the pictures are from a Mac. One source is the SMPTE Documents website. On your Mac computer, in Finder, click “Command-Shift U” to go to 'Utilities' folder. Drag the .py file to Utilities folder; authenticate with your password when asked. While still in Finder, click “Command-Shift O” (O as in Opal) to go to 'Documents' folder. Create a new Folder (Cmd-N) and immediately type "pink_noise", then Return to name it. Open the 'pink-noise' folder with Cmd-O or double click. In Terminal, type “python " including a trailing space. From the Utilities folder, drag the 'ST-2095-1-generator.py' icon to the Terminal window. From the top of the previously opened ‘/Documents/pink_noise’ folder, drag the folder icon to the Terminal window. Add a slash bar and a file name for the pink noise file to be generated: e.g., "/48_10_1.wav"
Hit “Return", then wait until the script tells you how long the process took and the RMS value. Go to ‘Documents/pink_noise folder’ to see the new .wav file. Click once, hit Space bar to listen. If you are unfamiliar with the techniques detailed above, all that dragging and dropping is used to avoid figuring out –and mistyping – the paths to the documents. Terminal is kind enough to let you drag a file and it fill in the data. In Terminal, click up arrow which brings up the previous command. Hit left arrow to the Capital "D" in Documents. Type "-d 20 ", or the desired length in seconds. Note the space. Make certain there is only one space in between the '20' and the 'D'. Hit the right arrow to 2nd underscore in the .wav file name. Hit "delete" 2 times. Type "20". Hit "Return" to create the 20 second file. The following command will create a .wav file that has 6, 30 second channels of 96k pink noise. 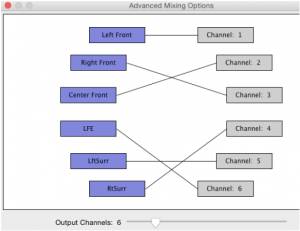 The six channels in that example will play simultaneously. 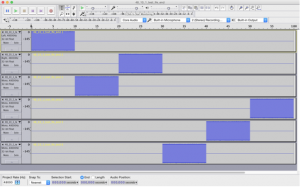 To create a file that will play the channels consecutively, or to change the levels or add a Fade In or Fade Out, or trim the lengths (a 10 second request will create a file longer than10 seconds), it is necessary to use an audio editing program. While many are available, the examples used below are for the well regarded, free and Open Source program, “Audacity” . Drag the Audacity folder to the Applications folder. You should see a single channel of pink noise that is a little shorter than 22 seconds. To Cut or Fade Out from 20 seconds, with the "I-bar" selected, click, hold and drag to the right. Leaving the last 1.8 seconds selected, hit 'Delete'. Click "X" in upper left corner of any track to eliminate one track. Name the channel by pulling down the box to the right of the 'x'. Click Cmd-A to select all the tracks. Pull down the menu "Tracks" to "Align Tracks" to "Align End to End"
'Click Cmd-F' and 'Shift-Cmd-F' to get the entire set of tracks in the window. Name file as desired, but definitely change the name or directory. In 'Format' pull down to 'Other uncompressed files'. Click 'Channel: 3' on right side. A connection will appear. Click 'Channel: 2' on right side. Connect it to 3rd box down on left side. Click on connection bar between 3rd box on both sides to remove it. Do the same to swap RtSurr and LftSurr for Channels 5 and 6 - have real fun with 8 channels. NB: This technique only works if all channels have identical signals! If, for example, the LFE channel were increased by 10 dB before the Export, following the above Export example will create a Right Surround that is 10 dB too hot. Go to /pink_noise folder and open new file in Audacity using the “Open As…” technique described previously. If you merely double-click on the .wav file, iTunes will likely import it and play it for you. Now that the .wav file is open, filters can be applied or levels can be adjusted. 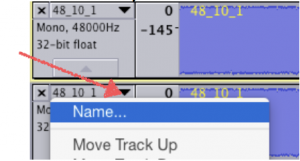 Select – carefully select – the audio portion of the track, then pull down ‘Effects’ to ‘Amplify’, then put in the number of dB to add (or -dB to subtract). Do your best not to amplify the silence. But it is possible that you will not be able to avoid ‘grabbing’ a small portion of it. You must export again to create a .wav file. When you “Save” in Audacity, you are creating an Audacity specific file set, not a playable .wav file. But if you already have saved the .wav file so it plays channels in the proper order, then you don’t need to swap them on export again. There is more potential in using the Audacity program, but this should serve the basic needs. Please send document corrections or suggestions via the Contact Form. Thanks. The death of film need not be the death of the cinema. So begins Harry Mathias' latest book, The Death & Rebirth of Cinema: MASTERING THE ART OF CINEMATOGRAPHY IN THE DIGITAL CINEMA AGE. Here is the link at Amazon.com: Harry Mathias, but once you get to Amazon you can do the google thing and find other less monolithic places to buy from. Many universities are using this book, from UCLA and USC, to Baylor and the facility he teaches at, San Jose State University. Graciously transmit and extremely knowledgeable are the first two thoughts that get attributed to Harry. It's great to see the respect that his forth book is getting. Side note: Speaking of training, I can't get enough of FilmmakerIQ.com – everything on the site is well researched and interesting. I'm sure Harry won't mind your putting his book down for a few minutes between chapters to enjoy a video or two.